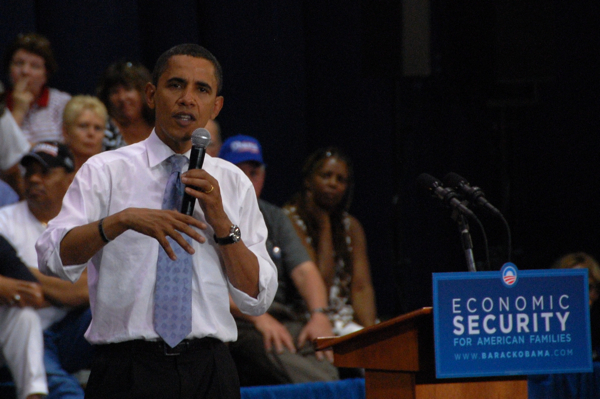 Barack Obama speaks to a crowd gathered in Titusville, Fla., during the campaign in early August. Unfortunately, I won't get this close to him in Washington. Like any normal human being, I have opinions. Some of them are political, however bland they may be. And, through deduction, we can at least assume that journalists are human and that they must have opinions, too. But what I do not have is the overwhelming urge to tell everyone about my political opinions. The only times I exercise that privilege is on Election Day and in very private conversations. My job prevents me from going further. With that in mind, I won't subject faithful readers of The Offlede to those views during my Inauguration Day experience in Washington. I simply will describe what it's like to be there on a historic day for the United States. And I don't think I'm alone - despite varying opinions - in saying that the country is hoping for and desperately needs a clutch performance in the next four years from Barack Obama. As for the present, I arrived at Orlando International Airport on time, which I can't say for the last time I was on vacation in Washington. This trip is already off to a good start.